Try this Paper Roses Tutorial for an easy way to learn how to make these flowers. 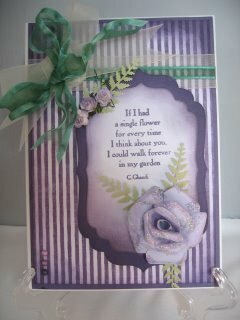 This short video will show you step by step how to reproduce for yourself these very lovely flowers. This is the card that is made on the video but if you look carefully you will see there is a slight difference to the finish. In the video I added the Spellbinder shape to the top of the card over the ribbon.....but I decided that I didn't like it there so I have moved it further down the card. As I tried to remove it from the front I tore the top left corner....so ....although the veres says "If I had a single flower..." you will see that I have added three more small, shop bought roses to the top left of the shape to hide the tear. Who's a silly girl then? But I think I have disguised it quite well. I hope you will give this Tutorial a try as they are really quite spectacular and much more realistc in real life than on a screen. I am sure you will not be disappointed with the result, and it is an excellent way to use up some of your paper scraps.